As the NAM summit opens in Tehran on Thursday, Nikhil Lakshman, who is traveling with the prime minister, captures the mood in the Iranian capital. Bhavishmeet Singh Patwalia plans to go to Moscow to pursue medical studies after he finishes school. Bhavishmeet is the head boy at the Kendriya Vidyalaya in Tehran, one of 190 students of all ages at the Indian school in the Iranian capital. His father is a doctor, a Sikh who was born in Tehran. Why doesn't he want to go to medical school in India, I ask. "It is too tough to get admission there, especially for students from abroad," says Bhavishmeet. Pushvir Atwal, the school captain at the Kendriya Vidyalaya, wants to be a dentist and may go to dental school in India. Her father too is a Sikh who was born in Tehran and is a successful importer of butter. Jasmehar Singh is quite the rock star, strumming a guitar in anticipation of the ensemble act the school's senior students will perform for Gursharan Kaur, the Indian prime minister's wife who is visiting the Kendriya Vidyalaya on Wednesday morning. His father, like Bhavishmeet's and Pushvir's dads, was born in Tehran and is a businessman. At some stage in his life, Jasmehar says he would like to go to London and perhaps become a musician. Bhavishmeet wears a turban; Jasmehar a patka. Jasmehar says he has never heard of a Sikh man or boy being bullied in Tehran for wearing the articles of their faith. All three children are part of the Sikh community that has lived in Iran for close to a century. The Sikhs began migrating to Iran from the Punjab in the 1920s, settling down in Tehran and in Balochistan. Today, there are about 76 Sikh families in Tehran, an elderly Sikh gentleman escorting us to the Kendriya Vidyalaya from the gurdwara next door, tells me, and about four Sikh families in Zahedan in present day Iranian Balochistan. "Four -- husband, wife, two children -- multiplied by 80 (families), sab mila ke honge 320," he adds. Many Sikhs left Iran after Ayatollah Khomeini seized power in 1979, apprehensive of their fate in the Islamic Republic that swore its allegiance to the Shar'ia. The rest settled down to an uneasy existence in a country that constantly imposes many restrictions on its citizens. None of the children this reporter spoke with express any disenchantment with being Iranian. "We are Iranians, but Indians too," one tyke, who enchants the audience later with her enthusiastic dancing, tells us. None of the children say they plan to live anywhere than the country where their parents were born. The adults, most of whom are businessmen, are not sure though, having seen many migrate to the West and elsewhere in recent years. And even though they have been born and brought up in Iran, the elderly still nurture that classical dream of the Indian Diaspora, living their sunshine years in the Mother Country. 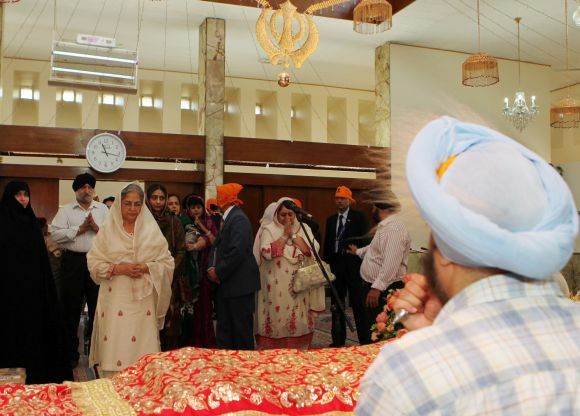 Five centuries before the Sikh community landed in Tehran came the faith's founder Guru Nanak, and the priest at Tehran's Gurudwara Bhai Ganga Singh Sabha points this out to the congregation that has gathered there during Gursharan Kaur's brief visit to the shrine on Wednesday morning. The gurdwara is a modest two storeyed building, founded 71 years ago. Its religious services include morning and evening prayers and a langar on Friday, the holiday in Iran. As the Gurbani rings out through the hall, one feels the power of faith that binds this tiny community together, a veritable island in an ocean of Shiite Islam. Like many elderly folk, Gursharan Kaur has a problem climbing stairs, but she gamely walks up the flight of stairs to enter the sanctum sanctorum where she offers three silk chhadars to the Guru Granth Sahib. As I leave, I spot her, eyes closed, lips moving in devotional song, perhaps praying that her husband's unfortunate troubles are sorted out soon. Tehran reminds me of so many cities -- like Seoul, it is ringed by mountains; there are hilly parts like San Francisco; some areas remind me of my beloved native Mumbai; other precincts could belong to a smaller Indian city like Ahmedabad, for instance. Even though it may not have a distinct architectural character like Lutyens' Delhi, there is something quite quaint about Iran's capital city. A colleague tells me how he was nearly suffocated by the traffic pollution on a visit some years ago. Happily,Tehran's infamous traffic snarls are absent during our visit. President Mahmoud Ahmedinejad's government has declared a six-day holiday in Tehran for the Non Aligned Movement Summit, even given residents petrol largesse to encourage Tehranis to leave the city and head for picturesque destinations like Ishafan. So Tehran's roads are mostly empty, banks and other businesses are shut, and the Tehranis still in town seem to be clearly enjoying their holiday. There are no signs that Tehranis will heed the call of dissident social networks that have called on them to stay in the city and gather in the streets when the main NAM summit opens on Thursday, for the first time since 2009 when the Green Revolution protesting against Ahmedinejad's dubious victory over Mir Hossein Mousavi was crushed by the Revolutionary Guards. The Revolutionary Guards, which owe their allegiance to Iran's Supreme Leader Ayatollah Ali Khamenei, the dissidents feel, may not go berserk, given the large international media contingent in town for the NAM summit. But given the advisories issued to the Indian media delegation accompanying Prime Minister Singh -- "Do not shoot video or photographs in public places without permission!!" 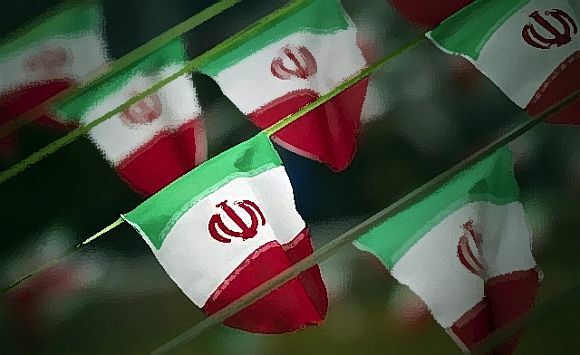 (an Indian television reporter was briefly arrested on Tuesday for doing so) -- it is doubtful if the Iranian security agencies will permit media coverage should such rebellion manifest itself on Tehran's streets on Thursday or Friday. After all, this is a country which monitors the Internet a tad more crudely than the People's Republic of China does -- in the PRC, one could access Rediff.com; in the Indian media centre in Tehran, Rediff.com is blocked as are many other Indian Web sites. No one can enter the hotel where the Indian media is staying without sporting a NAM Summit pass. What if some member of the dissident campaign dropped in and spread the word about how Mousavi, his wife Dr Zahra Rahnavard and former Majlis speaker Mehdi Karroubi (whom Atal Bihari Vajpayee, the last Indian premier to visit Tehran, met in April 2001) should be freed from house arrest? Or as one of my colleagues quipped what if a member of Tehran's liquor mafia slipped in with some booze for the Indian media? Alcohol is strictly forbidden in Iran. Other dissidents have called for NAM leaders to demand access to Mousavi, Rahnavard and Karroubi. Still others have asked Tehranis to go to their roofs during the summit and scream 'Allah-o-Akbar.' The Green Students of the Universities had called for peaceful demonstrations on campus from Sunday onwards -- none have been reported so far. Iran's Kaleme Web site has reported that the Ahmedinejad regime has spent at least $100 million on giving Tehran and the buildings where NAM leaders will stay/visit a new look; 200 Mercedes (of which I have not seen any so far), Kaleme said, have been bought for $58 million to ferry the leaders across town. The Web site estimates the cost of holding the summit at $1 billion; in comparison, it notes, only $50 million has been spent on relief in Iran's East Azerbaijan province where an earthquake struck a few days ago, killing over 200 people. The NAM summit is a big shoo-sha for the Iranian regime that has been isolated by the United States and America's European and Middle-East allies for a long time. 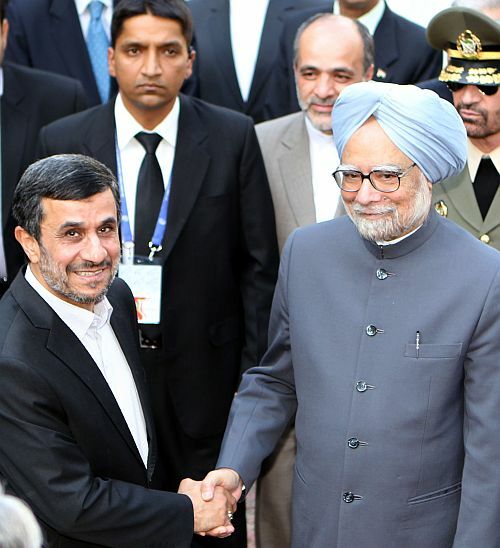 For Ahmedinejad and his boss Khamenei, the NAM summit is an assertion that Iran is still not a pariah for most of the planet. After all, at least 30 heads of State or government will attend the summit. Other representatives from NAM's 120 members will be present as will United Nations Secretary-General Ban Ki-moon (who Israeli Prime Minister Binyamin Netyanyahu strangely demanded that he not attend). 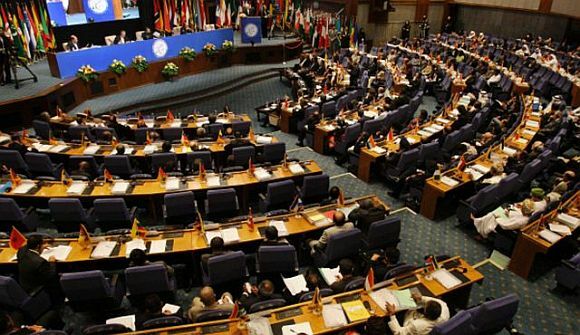 Under fire for its nuclear programme -- that has resulted in the US and Europe imposing crippling sanctions targeting the Iranian oil trade since July 1 -- Iran will no doubt shrewdly use the NAM summit to demonstrate the Movement's support for its right to pursue an atomic agenda. After the imposition of American and European sanctions, Bloomberg noted that Iran has lost $133 million a day in oil revenues. It still pumps 2.8 million barrels a day -- down by a million barrels since January -- since any further cuts would damage its oil wells. Since it sells only 1.6 million to 1.8 million barrels per day, the rest is stored aboard its tanker fleet which, according to The New York Times, sails around in circles in the Persian Gulf as Iran's oil ministry tries to sell the crude to daring buyers at low prices. Western and Israeli expectations are that Iran will use the NAM summit to issue fire-and-brimstone statements associated with its leaders like Ahmedinejad (who, incidentally, never said he would like to see Israel wiped off the face of the earth; blame incorrect translation of the president's Persian for a statement that he has come to be defined by). But briefing the Indian media the evening before NAM heads of State and government convene for the main event, Indian government sources said "the priority of the host country is to see a successful 16th summit, and for that to happen, the language, the discussions and the negotiations must be right." At the helm of the NAM summit for the next three years could possibly enable a softening of Tehran's position on its nuclear programme, bring about some measure of compromise that has so far eluded the P5+1 (the US, Great Britain, France, Russia and China plus Germany) nations who have engaged in negotiations with Iran for the last couple of years and send back the dogs of war into the kennels of peace, however uneasy it may seem to them. One diplomatic pundit felt on Wednesday that the prime minister is wasting his time by attending the NAM summit and not attending the United Nations General Assembly next month. Prime Minister Manmohan Singh has given the UN General Assembly a miss several times during his tenure, deputing the external affairs minister instead. Whatever the world thinks of NAM -- 'bacchanal nonsense' was the Washington Post's unfortunate recent description -- no Indian prime minister, no matter what his political hue, can turn down an invitation to attend a NAM summit, given the fact that the Movement was spawned by Nehruvian diplomacy and is an article of faith in Indian diplomacy's canon. The only time, incidentally, an Indian prime minister was not present at a NAM summit was in Havana in 1979, when the nation was in between prime ministers (Morarji Desai had resigned and Charan Singh had yet to take office). The last time India hosted a NAM summit was in 1983. Iraq was then meant to host the summit, even building the Al Rasheed hotel for the event, but it was at war with Iran and Ayatollah Khomeini forbade the Iranian delegation to travel to Baghdad. So the venue was moved to Delhi and delivered two iconic images for my generation -- Fidel Castro hugged Indira Gandhi while Yasser Arafat kissed the intimidating lady. History has come full circle with the event moving to Tehran. Arafat is dead, presumably poisoned by foes unknown. Commandante Fidel has long been ill and will be represented by a Cuban vice-president. And India's prime minister won't stay for the end of the summit on Friday, having flown home to attend to more urgent domestic matters that morning.